Lynne Steren on June 24 holds some of the jewelry that was returned to her after a new ordinance in a Milwaukee suburb helped track down the man who took it from her East Troy, Wis., home. Law enforcement and local governments are scrambling to shut down a shadow industry that has grown around the booming gold business nationwide: thefts targeting jewelry that can be converted into quick cash at the many local gold-buying shops. Milwaukee passed an ordinance this summer to help police spot stolen jewelry being sold before it was too late to recover. 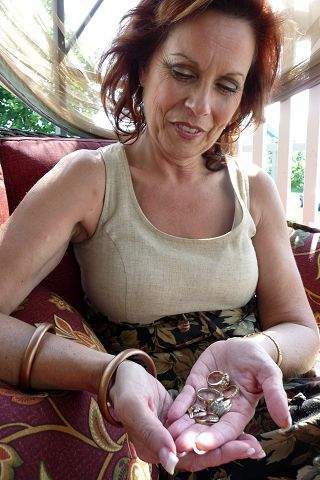 This June 24, 2010, photo shows some of Lynne Sterens recovered jewelry in a her East Troy, Wis., home. MILWAUKEE  Law enforcement and local governments are scrambling to shut down a shadow industry that has grown up around the booming cash-for-gold business nationwide: Thieves are snatching jewelry, then converting it into a quick payday at the shops. Thousands of shops have opened to take advantage of high gold prices and hard economic times, and police in some cities have noticed an uptick in burglaries and thefts. 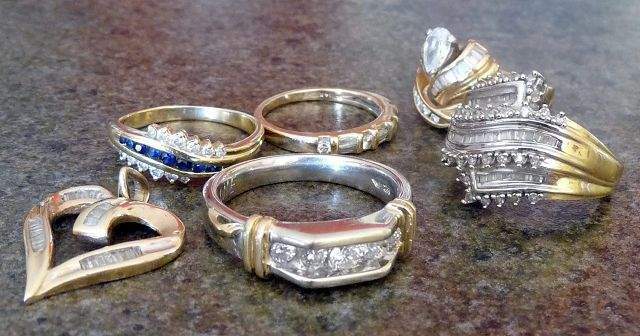 Concerned about a growing criminal trade, Milwaukee passed an ordinance this summer to help police spot stolen jewelry being sold before it was too late to recover. Other cities are rushing to take similar measures, finding that the usual methods for tracking stolen goods werent coping with the modern-day gold rush. Gold-buying businesses began proliferating when prices started rising in 2005, reaching more than $1,000 an ounce in 2009 and around $1,200 now. Cash for Gold billboards cropped up along highways, TV commercials urged watchers to mail in their gold for money and exchanges opened in unusual places such as liquor stores and hair salons. In Milwaukee alone, the number of businesses licensed to buy jewelry increased from 16 in 2007 to 59 last year. In Maryland, one of the states revising its enforcement, licensed vendors of precious metals more than doubled in the last two years to 545. The businesses included not only shops but gold-buying events at hotels or Tupperware-like parties in homes. Local authorities couldnt keep track of all the precious metals changing hands and discovered that not all the sellers were people who had jewelry they no longer wanted. Police here said they caught several thieves and drug addicts who confirmed they were stealing jewelry to sell to the shops. No comprehensive statistics on gold or jewelry thefts nationwide are available, but burglaries increased about 4 percent overall in Milwaukee from 2007 to 2009, while all other crimes decreased  a pattern investigators linked in part to stolen gold. Investigations last year at six shops found $75,000 in stolen jewelry and led to the clearing of 16 burglaries, said Milwaukee police officer Glenn Podlesnik. The city fined the shops about $64,000 for failing to keep required records on sales. Police in Georgia and North Carolina recently broke up a large burglary ring that was targeting gold and jewelry, said Mac Abercrombie, a detective in Douglasville, Ga. Six suspects were arrested in Georgia, and at least 30 other people are suspected of involvement. In Anne Arundel County, Md., east of Washington, D.C., arrests for stolen goods sales at gold shops and pawn shops rose 200 percent from 2007 to 2008. Authorities say the gold sales overwhelmed anti-crime recordkeeping requirements that were designed for pawn shops. Clerks were required to record information about the sellers and items sold, but it often wasnt entered into a law-enforcement database for weeks. Even when there was a required holding period for items bought, the jewelry often had been resold or melted down to make new precious objects before police caught up. Gold shop owners insist they merely are providing a legitimate service for customers in hard times and shouldnt be blamed for the crimes. We opened the store, and we had two people sitting outside, Oh, we want to sell some gold, said Firdous Chandani, owner of Reflections Jewelry in Milwaukee. He said his shop has been buying about 350 grams of gold a day from people eager to take advantage of the high prices. In July, the Milwaukee Common Council voted to require all gold-buying shops to submit electronically the sellers name and photo to police, along with a photo of the items sold. Last fall, Maryland passed a similar measure and on Oct. 1 will require buyers to have a fixed location. Last year, Florida started requiring mail-in gold-buying companies to put sales information on a database accessible to law enforcement. The accelerated identification reporting in a Milwaukee suburb, Greenfield, helped produce a surprise recently for an East Troy woman. A thief had taken jewelry from Lynne Sterens home, including her dead husbands wedding rings, to two gold buying shops. Police not only recovered some of the items but had the name, address and photo of the man who had sold them  her stepdaughters boyfriend, Patrick Brhely, 23.